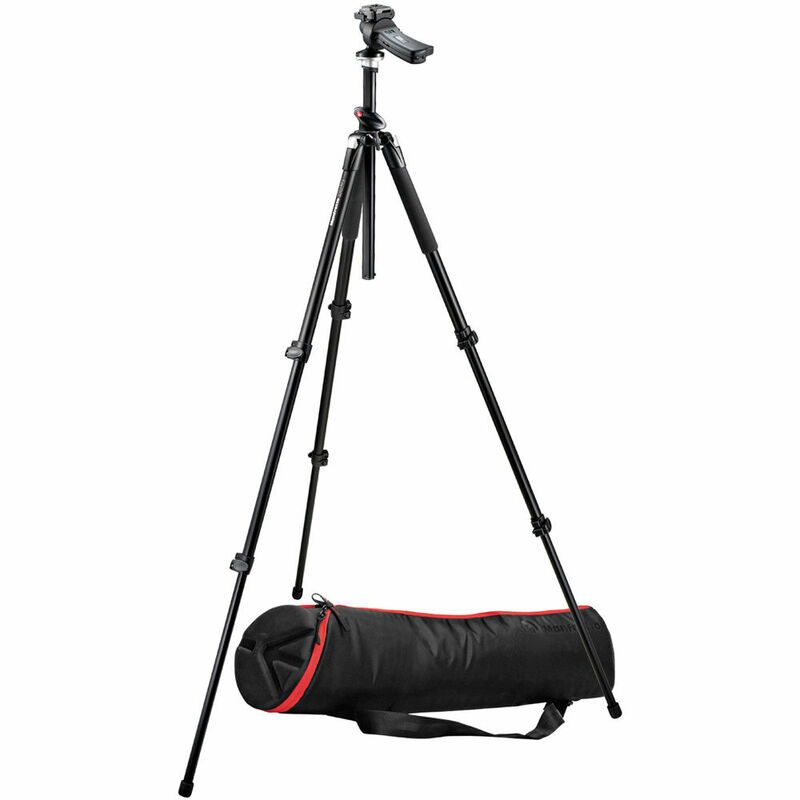 The Manfrotto 055XPROB Tripod is their most fully featured medium weight class aluminum legset, delivered in this configuration with their very popular 322RC2 Grip Action Ballhead and a well-made padded bag. Manfrotto makes a great aluminum tripod, and they're continually improving a basic design frameset that's survived for over two decades now. This latest-generation 055XPROB model features improved flip-lever leg locks and a center column which doubles as a lateral arm and does so at just a moment's notice. Rated for 11 lbs (5kg) and with 29.4mm diameter upper leg segments, this tripod's appropriate for use with SLR cameras and any lens smaller than a 300mm f/2.8 (the legs can support a 300mm f/2.8 by exchanging the ballhead). This particular kit (with the 322RC2 head) is an ideal choice for working professionals and advanced enthusiasts wanting the fastest possible unlocking/repositioning/locking speed for the tripod head. It is perfect for wedding applications. As delivered, it will place the camera's viewfinder at or above the eye level for the majority of people when the legs are extended and the column is fully retracted (the 'working height'). Entire column can be detached for low operating heights. Box Dimensions (LxWxH) 10.5 x 10.5 x 34.5"
055XPROB 3-Section Tripod with 322RC2 Ballhead & MBAG80 Padded Bag is rated 4.8 out of 5 by 84. Rated 4 out of 5 by snyderman from First 'real' Tripod: Homerun! Using the tripod and ballhead for both indoor and outdoor portraits. Rock solid (and a bit on the heavy side) and very stable. The grip-action ball head is perfect and very easy to use when manipulating the camera angle or orientation. Only reason I didn't give this product 5 stars is due to its weight. Along with stability comes weight, I guess. The 'leveling' indicators are spot-on as well. Took a bit of practice with the ball head and tensioning system to make 100% everything is level for shooting, but once you get the hang of things, reading the level indicators provides perfectly straight shots. Rated 5 out of 5 by Marilyn M L. from Everything I had hoped It arrived just in time, It is so easy to use, and it is quick and responsive just as I thought. It is a little heavier than I thought it would be but no matter it is not enough to matter. This is only my second tripod but both were Bogen/Manfrotto and the other now is going on 16 years. I just love it. Recently I needed some tighteners for my old one and I called Bogen up and they sent them out. They had them in stock and very easy to find. I am a semi pro camera nut and have a wedding to go to, mostly outdoor activities, so need the movement but stability, and got this in the new tripod. Can't say enough good. To me it is all about service and that is one thing you can count on with this product. Rated 4 out of 5 by Anonymous from Works Well I haven't got to use it as much as I've wanted yet(new baby) but when I have it's worked well. Sets up pretty quickly, comes with the ball head already attached, carry case is nice. However the ball head leaves a little to be desired. The quick release of the camera is awesome but sometimes requires a little wiggle to get it tight, and the friction adjustment only makes it harder to get it to break free from it's current position and then it wants to flop over especially if your using it to get a portrait frame. That all being said I would buy this set again. Tripod gets 5 stars and the head gets 3 1/2 stars. Rated 5 out of 5 by gVisions from Manfrotto tripod I procured my Manfrotto 055XPROB 3-section tripod with ballhead to use in photographing wildlife along the Texas Coastal Bend. In particular I am using it to capture bird images around Redfish Bay.The tripod works well on the froward deck of my skinny water boat as well as off the boat in the shallows. This is a area that experiences a great deal of southeast wind often blowing from 8-15 mph and higher. These conditions can vary greatly on any outing and setup, stability and the hand grip release make a great combination for what I need. Rated 5 out of 5 by fdmboston from Notably better than the 290 series I originally bought a Manfrotto 294 with a panning head, then returned it for the 055 and 322 head. (I didn't get the case). This is rock steady, and the ball head with the joystick is a real pleasure to use. I'm an advanced amateur, and it is great that manfrotto makes professional gear at a realistic price point for people like me. At least for me, this is much easier to set up and use than the 294, and only a bit heavier and only a bit more expensive, especially with the rebate. At the same time, it is incredibly cheaper than the super fancy equipment that would be the next step up from here. You shouldn't have any concerns about getting this unit. Rated 5 out of 5 by Anonymous from Just what I wanted This tripod can put you in the position you need to have your camera just where you want it. I like the latch on the legs so that you can adjust quickly vs the twist type that take much more time to get into position. It is tall enough to use as I am 6'3 so I do not have to bend over just to look in the camera. I really like the 322RC2 Ballhead with the hand release adjustment so that you can put the camera just where you want it very quickly. For panoramic shots it will not be quite as good as other gear type heads but for everyday use this is much better. It came with the padded case which holds both the head and the tripod very well and will make transporting it very nice. Very please with the whole thing. Rated 5 out of 5 by Spotter Six from This product exceeds every expectation. This tripod is easy to carry, set-up and use. The leg adjustments are simple, secure and easy to adjust. The tripod is light enough to carry but heavy enough to produce the stability needed. The RC2 head is easy to use, adjust and works well for fine adjustments using a camera and sport optic. I can't over emphasize how sturdy and well built this tripod is. A must have for anyone looking for stability with their optics. This tripod must be used to be fully appreciated. I find nothing about this tripods design and function that needs improvement. It's an investment that exceeds expectations and will last a lifetime. Rated 5 out of 5 by Anonymous from Very nice combo... As far as an aluminum tripod, I feel that it is light for it's weight capacity. You can't compare it to a Carbon Fiber for weight. When I took it out of the box I extended everything including the CC and mounted my gripped 20d w/70-200IS attached to it. Very sturdy. The 322 ballhead needed a little tightning out of the box, but it held very well. The trigger grip is easy to use and sets very easy. I have the RC2 system, so it all works well. The tripod bag is very nice and well padded. I wish there was a small zipperd compartment somewhere. wHAT IS THE BUTTON FOR AT THE BASE OF THE CENTER COLUMN? The button is so you can deploy the column laterally. In other words, you can flip over the column horizontally so you can shoot down, directly over your subject.